Posted by admin in Eyjafjöll, Iceland, miscellaneous, volcano culture, volcanoes. Fancy your own table-top volcano? Well, with card, scissors, glue, and a little patience, you can build your own three-dimensional model of Eyjafjallajökull, courtesy of the British Geological Survey. Just print off their PDF of the component parts from the BGS website (in colour, preferably) and cut them out* and put them together according to the instructions and hey presto, your very own Eyjafjallajökull. The model is both a cut-out and a cut-away, as it is designed to reveal the volcano’s inner workings in schematic form, and it comes complete with ash-laden plume. The BGS website says the model is ‘intended as a simple guide to understanding how volcanoes such as Eyjafjallajökull are influenced by tectonic plate activity along the Mid-Atlantic Ridge’. * When it comes to the cutting out, ‘you may need to get an adult to help you’. 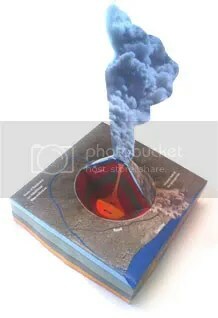 Other model volcanoes: John Seach’s baking soda volcano; a USGS-approved paper volcano; a really explosive model volcano; several different model volcanoes in a range of materials; some artificial volcanoes for the home, several of them highly dangerous. Posted by admin in volcano culture, volcano tourism. Atlas Obscura is a great travel site, ‘a compendium of this age’s wonders, curiosities and esoterica’, and in honour of the Eyjafjallajökull eruption it is currently running Volcano Week, bringing together lots of volcano-related content and imagery. What is nice about Atlas Obscura’s Volcano Week is that the site is featuring not only volcanoes themselves (Erebus, Erta Ale, Toba, Mauna Kea and more) but an intriguing range of landscape features and monuments with a sometimes offbeat volcanic connection: thus we have Saint Michel d’Aiguilhe, a medieval chapel on a peak formed of the eroded core of an ancient volcano in France; Clermont-Ferrand Cathedral, constructed entirely from local dark volcanic rock (it’s Volvic trachyandesite); sulphur mining at Kawah Ijen in the Ijen Volcanic Complex in eastern Java; the fulgurites of Mt Thielsen in the Oregon High Cascades; and the scarily toxic Laguna del Diamante in Argentina, home to a flock of singularly tough flamingoes. There’s much more – take a look. 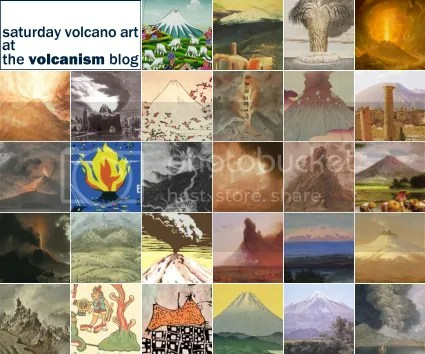 The Volcanism Blog’s Saturday Volcano Art feature is taking a break at the moment, but will return later this year (2011). When the series returns I hope to feature more volcano images by modern and contemporary artists (although great volcano art of the past will of course continue to appear). I already have some great modern works of volcano art lined up, but I am keen to know of more … so, if you would like to suggest contemporary artists you know of for inclusion, please get in touch. It’s important to note that in the case of modern and contemporary artists I must have the permission of the artist or rights holder to feature their work on this blog so I can’t guarantee that your favourite modern volcano painting (or drawing, sculpture, mural, engraving, installation, cartoon, happening or whatever) will appear here, but please feel free to make suggestions and I will do what I can. Posted by admin in Fuji, Japan, volcano culture. 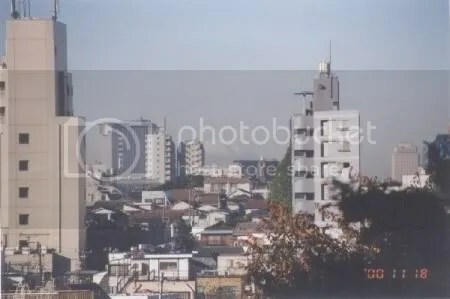 Mt Fuji from Nippori Fujimi slope on 18 November 2000 (photo by Mr Naofumi Nakajima). Among the many ways in which human beings interact with volcanoes, one of the most important but also least tangible and hardest to quantify is the simplest of all: looking. Protecting a building or a park may be one thing, but how do you protect a view? Saving the view from Nippori’s Fujimizaka would require capping building heights within an elongated fan-shaped corridor three miles long and up to 1,000 feet wide across densely populated neighborhoods. So far, the society has met stiff resistance from city officials and developers in Tokyo, whose properties rose rapidly from the postwar ashes thanks in part to unrestrained construction. For centuries, the views of Mount Fuji offered by many parts of the Tokyo region have been a celebrated part of Japanese culture: but as Tokyo’s skyscrapers have climbed into the sky, the views have disappeared. Of the sixteen areas of central Tokyo called Fujimizaka, ‘the slope for seeing Mount Fuji’, there is now only one, in Nippori, from which the volcano can still be seen – just. The threat to this last remaining view of Fuji provoked the establishment of the Citizens’ Alliance to save the Fuji-view (CASF): the picture at the top of this post, from the CASF website, shows what they are up against. 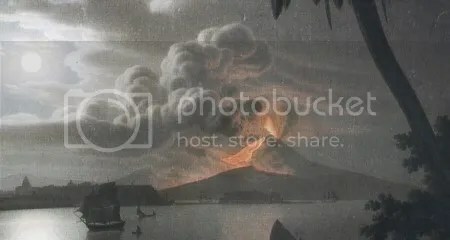 Posted by admin in Saturday volcano art, volcano culture, volcano images. Auguste Desperret (1804-65) was a French artist who produced political cartoons and caricatures for the republican satirical weekly La Caricature, edited by Charles Philipon, which flourished briefly in France following the relaxation of press censorship brought by the July Revolution of 1830. That revolution brought an end to the authoritarian rule of King Charles X, who was forced into exile and replaced by the ‘July Monarchy’ of Louis-Philippe I (who would in turn be overthrown in the revolution of 1848). The first issue of La Caricature appeared in November 1830, and the last in August 1835; the ‘September Laws’ of the latter year, passed in response to an attempted assassination of the king, reimposed political censorship of the press and ended publication. In those few years, however, La Caricature had drawn on the skills of some very talented artists – most notably perhaps Honoré Daumier – to create some of the most memorable and effective political caricature in the history of the genre. The lithograph reproduced here was published in issue no. 135 of La Caricature, 6 June 1833. 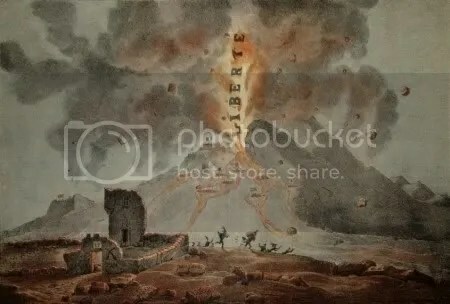 Its full title is ‘troisième éruption du volcan de 1789, qui doit avoir lieu avant la fin du monde, qui fera trembler tous les trônes, et renversera une foule de monarchies’: ‘third eruption of the volcano of 1789, to take place before the end of the world, which will shake all thrones, and overturn a horde of monarchies’. The first eruption of this volcano of liberty was of course in 1789 itself, the outbreak of the French Revolution. The second was the July Revolution of 1830. 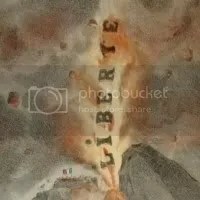 In this image, Desperret warns, as the July Monarchy increasingly turns against the principles of French republicanism, that the third such eruption is yet to come. Posted by admin in El Salvador, San Salvador, volcano culture. 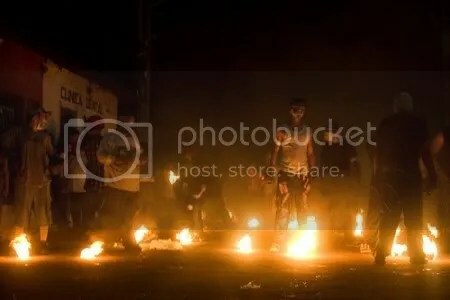 In the town of Nejapa in El Salvador, to the north-east of San Salvador volcano, 31 August sees the festival of Bolas de Fuego – balls of fire. Local people paint their faces, take to the streets and joyously fling burning balls of petrol-soaked rags at each other. The BBC reports that the festival commemorates a volcanic eruption that occurred in 1922, but there was no eruption of San Salvador that year. The festival seems to have started in 1922, and perhaps marks the eruption of 1917; or it might be the 1658 eruption, which forced the evacuation of the town, that is being recalled. Local religious tradition has it that the event celebrates the refusal of the town’s patron saint San Gerónimo to be distracted from good works by the Devil, in the form of the volcano, throwing fireballs at him. Anyway, it all looks like good dangerous fun. Everybody has a good time and no-one has, as yet, been seriously hurt. Posted by admin in Asama, Japan, Saturday volcano art, volcano art, volcano culture. The artist known as Hiroshige II (1826-69) was a student of the great ukiyo-e artist Utagawa Hiroshige (1797-1858), who has already featured in this series. He became his master’s adopted son and married his daughter, Tatsu, and, after Hiroshige’s death in 1858, used his name; he had previously signed himself as Shigenobu. To avoid confusion, he is generally known as Hiroshige II. There is also a Hiroshige III, who was also the first Hiroshige’s adopted son and also married to Tatsu, but let’s not get into that here. Mount Asama, the most active volcano on Honshu, is pictured in this image from Hiroshige II’s series One Hundred Views of Famous Places in the Provinces, published 1859-61. 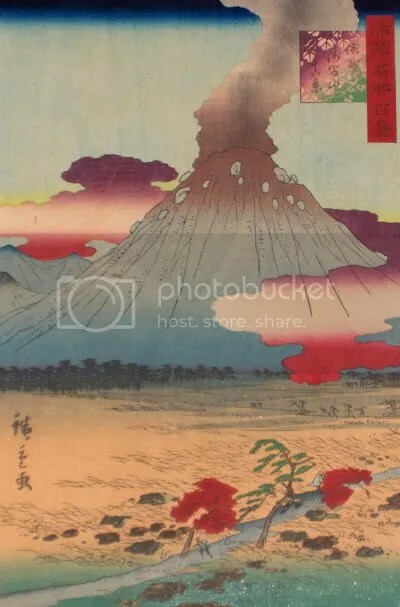 At the time this print was made the most recent significant eruption of Asama had occurred around 30 years earlier, in 1815, while in 1783 the volcano had produced one of the largest and most destructive eruptions (VEI=4) in modern Japanese history. The print shows the volcano viewed from the south-east: on the left is the ridge of the Korufu-yama arc, remnant of an older volcano. The summit of Asama is producing brownish-grey emissions and is covered with recent ashfall and crowned with large boulders. The reddish-purple cloud, edged with yellow, that reaches across the distant ridge to encircle the volcano gives the scene a threatening air, emphasized by the towering flanks of the mountain (their steepness exaggerated by the artist) and the tiny, fragile details of the landscape in the foreground – trees, bushes, hurrying figures. There is a pervasive sense of unease that is absent from the first Hiroshige’s landscapes: a brooding atmosphere of latent threat. In this image the volcano is a grey monster, overshadowing the landscape and stirring in its sleep. That sense of latent threat is by no means misleading. When this print was published Asama’s half-century of quiescence was coming to an end. In 1869 a VEI=2 event marked the beginning of a pattern of frequent eruptions (over fifty between 1875 and 2008) that has continued to the present day. Asama’s most recent eruption was in February 2009. The Danish painter Christen Købke (1810-1848) died young at 38, but in his short career he produced some of the most innovative and distinctive European landscape painting of the first half of the nineteenth century. He was a pupil of the celebrated landscape painter C. W. Eckersberg (1783-1853), one of the leading figures of Golden Age Danish art. Most of Købke’s landscape studies were of places near his home in Copenhagen – his father was a master baker who leased the army bakery in the city’s Citadel, and the family made their home within the fortress. Kobke produced numerous studies of scenes in and around the Citadel in which deceptively free brushwork and almost impressionistic atmospheric effects are constrained by unusual, highly structured compositions and restrained but lucid colour schemes. Købke journeyed to Italy in 1838, visiting Venice, Florence and Naples, and upon returning to Denmark in September 1840 devoted himself largely to painting Italian subjects derived from studies he had made while Italy. 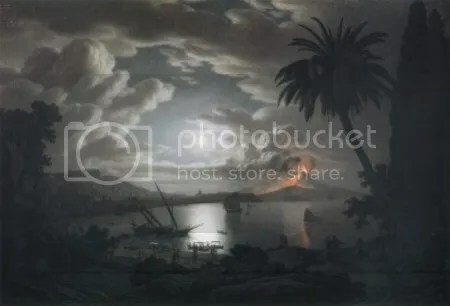 The scenery around Naples proved particularly inspiring for Købke, and he painted a number of pictures of the Bay of Naples and scenes around Vesuvius. The picture illustrated here, ‘The Forum, Pompeii, with Vesuvius in the Distance’ (1841) is one of the paintings dating from this period. In this painting Købke has chosen a typically unusual viewpoint: relatively low down, so that Vesuvius is glimpsed through a screen of classical columns and ruined walls. The long shadows being cast from the right – the east – show that the time is early morning, and the atmosphere of the still morning, with mist just rolling away from the slopes of the volcano and a flawless blue sky holding promise of heat to come, is powerfully conveyed. Although the volcano is partially obscured its low contours and dark, scored flanks dominate the scene. 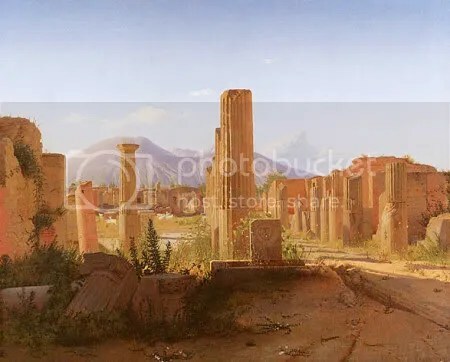 The simplicity of its brooding shape contrasts with the litter of ancient remnants in the foreground: shattered columns, overgrown carvings, the empty roadway leading away into a landscape of ruins. The painting is a meditation on the spirit of place, the passing of time, the transience of all man-made things. Christen Købke’s ‘The Forum at Pompeii, with Vesuvius in the Distance’ is in the collection of the J. Paul Getty Museum. If you’re in London next spring you can take in the exhibition Christen Købke: Danish Master of Light at the National Gallery (17 March-10 June 2010).